You can read The Road to Wigan Pier on-line free at Gutenberg-Australia. Wigan Pier was a coal landing jetty on the Leeds-Liverpool canal where it passed through Wigan. It is an ironic appellation, Wigan’s Pier bearing no more relation to a seaside pier than a lump of coal to a diamond. The Pier does not actually feature in the book at all, for the simple reason that it had been demolished some years before Orwell visited Wigan. You, dear reader, would be luckier if you visited Wigan today for the Pier has been rebuilt – perhaps because the locals got fed up with tourist types asking the way to something which did not exist. I wouldn’t bother making a special trip if I were you. I have just re-read “The Road to Wigan Pier” for the first time since I was a teenager. Blame Jordan Peterson, he’s always banging on about it. Orwell’s book is a valuable historical record of working class lives in the north of England at the height of the great depression of the 1930s, particularly that of miners and their families. Though published in 1937, the book describes Orwell’s visits to northern working towns in the Spring of 1936 (by the end of 1936 Orwell was in Spain). This is the pre-WW2 Orwell, and hence the Orwell before Animal Farm (1945) and Nineteen Eighty-Four (1949). You need to be aware of the date because when Orwell uses the phrase ‘pre-war’ he is referring to WW1. If you have never read an account of the working conditions of coal miners at that period, you should – and Orwell is as good a source as any. Simply put, the sheer physical arduousness of the work would be unsustainable by men today, even men used to labouring. British coal mines were generally very deep. Once underground a miner would need to ‘travel’ to the coal face – a distance of up to 3 miles along an excavated tunnel mostly little more than around four feet high. This ‘travel’ had to be undertaken doubled-up, with the back almost horizontal. You will appreciate why miners were generally small men. But the time taken for this ‘travelling’, typically between one and three hours daily, was unpaid. The miners’ working day began only upon reaching the coal face where he would hack away for some seven and a half hours on top of his ‘travel’ time. Orwell himself ‘travelled’ only one mile, a comparatively short ‘travel’, but was barely able to manage it and was certainly not capable of then putting in a full days labour – even had he otherwise been capable of doing a miner’s job, which he was not. And all this is done in the heat and blackness of a deep mine with the ever present threat of roof falls and death. 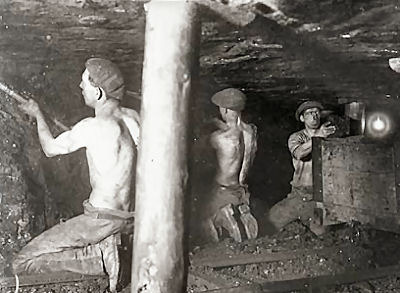 Orwell emphasises the extent to which all aspects of life in Britain were dependent upon coal, and hence upon the miners. But “The Road to Wigan Pier” is also a rare account of working people’s daily lives; their homes, their eating habits, their poverty, their standards. It is an account of the class divide which, at that time, was still absolute. It is the book in which Orwell describes himself, with admirable precision, as lower-upper-middle class. Whilst he was invariably taken as a toff by those he was anthropologising, Orwell barely earned as much as they. On this ‘genteel poverty’ Orwell is particularly good. He describes a sinking mass of the middle class – left stranded by the decline in the British national fortune after WW1 – whose class status depended entirely on education, pretension and ‘appearances’, the latter accomplished in the teeth of secret poverty. On the one hand, 1936 cannot be regarded as ancient history: it is within the lifetime of many people still living. On the other hand, 1936 is almost as distant from the present as it is from Wordsworth. Well it might be, for the conditions of life in the UK now bear little relation to those times, whatever people may insist. And yet, despite being a mere single lifetime distant, already the truth of those times – as described by Orwell – is submerged beneath the propaganda of ‘the historical oppression of women’. No. If you must have history in a sound bite it was this: the oppression of the many by the few. And both the many and the few consisted of both sexes. Women and children used to work down the mines too, but the Victorians put a stop to that in 1842 – the nasty old patriarchs! If I recall Homage to Catalonia correctly, his experience in the Spanish civil war caused Orwell to believe that Socialism really could work – thus revealing his earlier doubts about the matter – though it was also Orwell’s experiences in Spain that made him an ardent anti-Stalinist. For Orwell was a realist and was never a great fan of Marxist theory, and still less of those who espoused it. In addition to the urgency of thwarting the Fascist threat, Orwell clung to Socialism only because he could see no other way of affecting a change in the appallingly degraded conditions in which the bulk of humanity lived – and he was convinced that there was no economic necessity for it. He placed the blame squarely on the class system, as a good Socialist would. But for Orwell it was all about mass poverty. Orwell was never one to bang on about dialectic materialism or other Marxist doctrines. He knew too much about working men to confuse Marxist theory with reality. Indeed, the working class seemed to be just as in need of consciousness raising as they had been when they frustrated Robert Tressell so. People will accept almost anything if it’s all they have ever known – at least they did when TV was not around to make them envious of others. I love that “secret teetotaller with vegetarian leanings” (speaking as an unreconstructed beer drinking carnivore myself). And as for the so-called left being dominated by the middle class, what resonance that has today. Orwell is scathing about what we would later call “champagne socialists”. He sees through their pretensions to the unchanged class distain beneath. [CPGB = Communist Party of Great Britain]. Orwell was equally scathing about Socialist literature. Here is a passage in which he reveals that, in 1936, he was still ignorant about the situation in Russia. Orwell is frequently critical of Soviet-worship in “The Road to Wigan Pier”. However, it appears that his education about the true nature of Stalin’s Russia only really started in 1937 in Spain. Naively he imagined that the leftist forces in Spain would be united against the Fascists. Essentially by chance he happened to join a militia (the POUM) which, though Marxist and hence fighting the Fascists, was also an anti-Stalinist communist party. He would, initially, have been equally content to join the Soviet supported communist-run International Brigades. But Stalin had his own agenda in Spain, and he did not take kindly to interference. That the POUM was also Marxist was of little significance to Stalin. He decided to eliminate them. In May 1937, Orwell in his POUM militia was attacked, not by the Fascist forces he had gone to Spain to fight, but by the Soviet controlled forces which he had thought were allies. Thus were Orwell’s eyes opened and the author of the post-WW2 books was born. But let not the reader imagine that the Orwell of Animal Farm and Nineteen Eighty-Four had relinquished his Socialism. He is reputed to have written, after Spain, “At last I really believe in Socialism which I never did before“. And many years later, “Every line of serious work that I have written since 1936 has been written, directly or indirectly, against totalitarianism and for democratic Socialism, as I understand it“. At the risk of straying too far from my subject, if you have not read Orwell’s Preface to Animal Farm, you must – it’s here (somewhat annotated). “There is just this to be said for the unemployment regulations, that they do not discourage people from marrying. A man and wife on twenty-three shillings a week are not far from the starvation line, but they can make a home of sorts; they are vastly better off than a single man on fifteen shillings. This is one very significant way in which the present is worse than the 1930s (the family system has now broken up in the lower socioeconomic classes). This is particularly worth noting because, whilst the beneficial changes since the 1930s can be attributed to science and technology, this disbeneficial change must be laid squarely at the door of politics. Orwell was wrong about Socialism being the answer to mass poverty. He had the Romantics’ negative view of the ‘machine age’, and so he failed to predict that science, technology and birth control would provide the path to greater social justice, not Socialism. Despite some incongruous disparaging remarks about birth control, Orwell makes the following observation which is surely bang on the money. [Robert Smillie was the Arthur Scargill of his day, a miner’s trade union leader]. Bread and circuses, I guess. No, George, and they still don’t. Added 12/4/17: Recall Orwell mockingly referring to “Comrade X, author of “Marxism for Infants“? Well, a book published last month by MIT Press is Communism for Kids – aargh!! This entry was posted in book/film reviews, history on 29th March 2017 by William Collins.